The full inside story of the breathtaking rise and shocking collapse of Theranos, the one-time multibillion-dollar biotech startup founded by Elizabeth Holmes—now the subject of the HBO documentary The Inventor—by the prize-winning journalist who first broke the story and pursued it to the end. In 2014, Theranos founder and CEO Elizabeth Holmes was widely seen as the female Steve Jobs: a brilliant Stanford dropout whose startup “unicorn” promised to revolutionize the medical industry with a machine that would make blood testing significantly faster and easier. Backed by investors such as Larry Ellison and Tim Draper, Theranos sold shares in a fundraising round that valued the company at more than $9 billion, putting Holmes’s worth at an estimated $4.7 billion. There was just one problem: The technology didn’t work. A riveting story of the biggest corporate fraud since Enron, a tale of ambition and hubris set amid the bold promises of Silicon Valley. JOHN CARREYROU is a two-time Pulitzer Prize-winning investigative reporter at The Wall Street Journal. For his extensive coverage of Theranos, Carreyrou was awarded the George Polk Award for Financial Reporting, the Gerald Loeb Award for Distinguished Business and Financial Journalism in the category of beat reporting, and the Barlett & Steele Silver Award for Investigative Business Journalism. Carreyrou lives in Brooklyn with his wife and three children. "You will not want to put this riveting, masterfully reported book down. No matter how bad you think the Theranos story was, you'll learn that the reality was actually far worse." "Chilling... Carreyrou tells [this story] virtually to perfection… Reads like a West Coast version of All the President's Men." "The definitive account of Theranos’s downfall, detailing its motley crew of executives, legal knife fights, dramatic PR stunts, and skullduggery... Offers a lot for foreign-policy wonks... 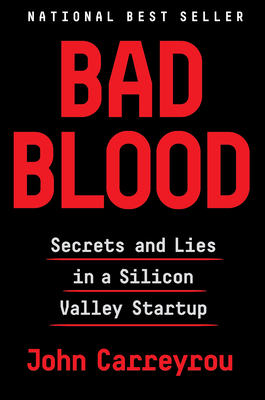 While Bad Blood is worth reading for its own merits—it’s a stunning feat of journalism that reads like a thriller—it also says a lot about Washington’s facile relationship with Silicon Valley. Most D.C. power brokers know next to nothing about science or technology but increasingly view Silicon Valley tech as a deus ex machina for some of the world’s most complicated challenges. Bad Blood offers a sobering warning of where that type of thinking can lead." "A great and at times almost unbelievable story of scandalous fraud, surveillance, and legal intimidation at the highest levels of American corporate power. . . . The story of Theranos may be the biggest case of corporate fraud since Enron. But it’s also the story of how a lot of powerful men were fooled by a remarkably brazen liar." "Even if you didn’t follow the story of charismatic Theranos founder Elizabeth Holmes (and the ensuing trainwreck) in the news, you will find yourself zipping through a book that proves once again that fact is stranger than fiction. A stunning look into a high-tech hoodwinking; like a high-speed car chase in a book." —The New York Post's "28 Most Unforgettable Books of 2018"
"In Bad Blood, acclaimed investigative journalist John Carreyrou, who broke the story in 2015, presents comprehensive evidence of the fraud perpetrated by Theranos chief executive Elizabeth Holmes... He unveils many dark secrets of Theranos that have not previously been laid bare… The combination of these brave whistle-blowers, and a tenacious journalist who interviewed 150 people (including 60 former employees) makes for a veritable page-turner." "Engrossing… Bad Blood boasts movie-scene detail… Theranos, Carreyrou writes, was a revolving door, as Holmes and Balwani fired anyone who voiced even tentative doubts… What’s frightening is how easy it is to imagine a different outcome, one in which the company’s blood-testing devices continued to proliferate. That the story played out as it did is a testament to the many individuals who spoke up, at great personal risk." "In exposing the fudged numbers, boardroom battles and sickening sums of money tossed Theranos’ way, Bad Blood succeeds in highlighting Silicon Valley’s paradoxical blind spot. Insular corporate culture and benevolent media coverage have allowed a monster to grow in the Valley—one that gambles not just with our smart phones or our democracy, but with people’s lives. Bad Blood reveals a crucial truth: outside observers must act as the eyes, the ears and, most importantly, the voice of Silicon Valley’s blind spot." —B. David Zarley, Paste Magazine's "16 Best Nonfiction Books of 2018"
"Carreyrou blends lucid descriptions of Theranos’s technology and its failures with a vivid portrait of its toxic culture and its supporters’ delusional boosterism. The result is a bracing cautionary tale about visionary entrepreneurship gone very wrong." "Crime thriller authors have nothing on Carreyrou's exquisite sense of suspenseful pacing and multifaceted character development in this riveting, read-in-one-sitting tour de force.... Carreyrou's commitment to unraveling Holmes' crimes was literally of life-saving value." "Eye-opening... A vivid, cinematic portrayal of serpentine Silicon Valley corruption... A deep investigative report on the sensationalistic downfall of multibillion-dollar Silicon Valley biotech startup Theranos. Basing his findings on hundreds of interviews with people inside and outside the company, two-time Pulitzer Prize-winning Wall Street Journal reporter Carreyrou rigorously examines the seamy details behind the demise of Theranos and its creator, Elizabeth Holmes… [Carreyrou] brilliantly captures the interpersonal melodrama, hidden agendas, gross misrepresentations, nepotism, and a host of delusions and lies that further fractured the company’s reputation and halted its rise."